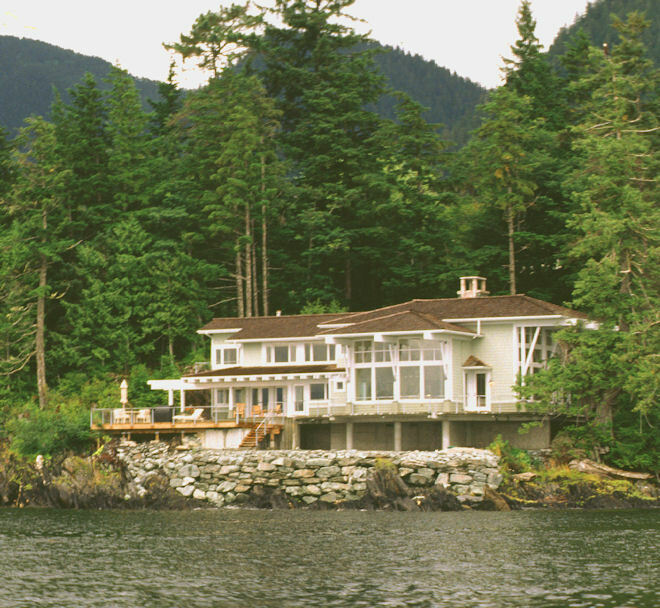 The Owner built the existing 60's vintage house in Ketchikan, Alaska. The residence is perched on a rocky peninsula at the intersection of two fjords with a private cove and sandy beach to the south. Grand views abound of water, sky, mountains, wildlife and shipping as well as more intimate views of the cove and surrounding rainforest. Countering to the natural beauty, the house must withstand up to 120 mph winds, a 13 feet of average rainfall and 20 foot tides. The existing oddly formed living/dining was demolished and replaced by a spacious entertaining area. The old and new roofs are integrated by aligning their similar roof forms. Two large bowed window walls in the living and dining frame Alaska's two distinctly different views. These view ports extend to the roof structure capturing the ever-changing skies. Typically pearlescent natural light fills the interior from these two openings. The expanded entry was rotated toward the drive approach, minimizing the impact of “the car” on the site. A small water facing breakfast area and butler's pantry addition fulfilled functional requirements while adding depth and shadow to the west façade. An integrated composition of covered porch, trellises and open patio was developed along the entire west and south elevations. Viewed from the interior, the intent was to establish a boat-like relationship to water on the west face.